Posted on November 3, 2014 at 6:47 pm. 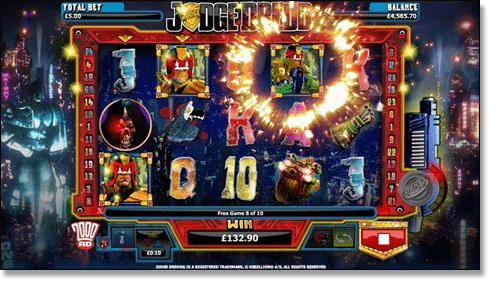 2000 AD’s comic strip super-hero Judge Dredd just got another gig in the media – this time the law enforcer is convicting, sentencing and executing offenders in his own online and interactive pokie game. NextGen Gaming has released what is sure to be a hit among comic book and Judge Dredd fans alike – a five-reel and 20 payline online slot game Australians can play for both practice cash and real money at a www.GdayCasino.com. G’day Casino is continuing to pave the way for new and exciting pokies, releasing more and more titles on a regular basis, Judge Dredd being one of the latest. NextGen Gaming – the Australian casino games developing branch of Swedish giant NYX Gaming, has been granted exclusive rights to produce Judge Dredd related content, with its licensing deal extending to mobile and tablet platforms. 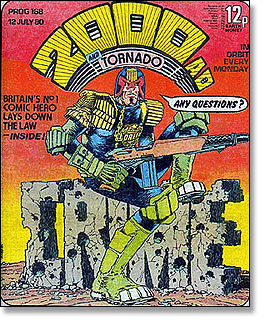 The game retains that classic feel evident in Dredd’s comic strips, as well as the older video games developed for consoles such as the Sinclair ZX Spectrum, Sony Playstation and Commodore 64, and stays true to the major Judge Dredd story-lines. At the same time, NextGen Gaming has been able to develop a title which focuses heavily on wild and bonus features (most notably the “SuperBet” option – an optional wager where we increase our bet to generate more wilds), and keeps up to date with advanced and high quality graphics and modern gameplay. And we couldn’t agree more with you, Dave. So popular is Judgde Dredd, the character has played a role in numerous forms of media such as movies (1995’s ‘Judge Dredd’ and 2012’s ‘Dredd’), novels, card, board and video games, and more. Play the game for real Australian currency or practice cash at www.GdayCasino.com, grab an unlimited matched bonus and a free slab of VB if your first deposit is $100 or more.